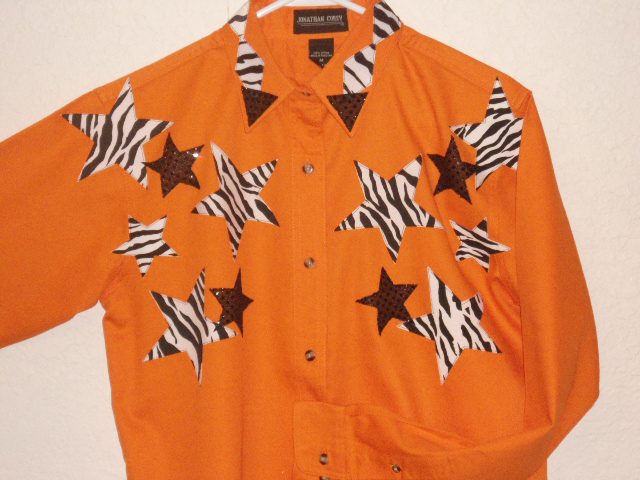 All rodeo shirts are custom designed by me. 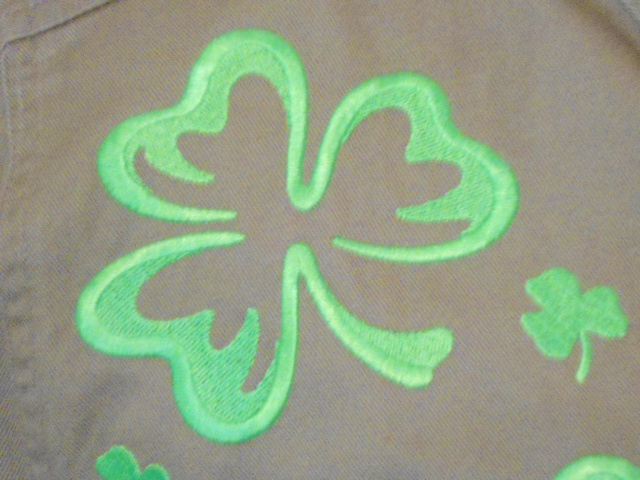 The Ultrasuede fringe and cutouts are all hand cut and sewn. 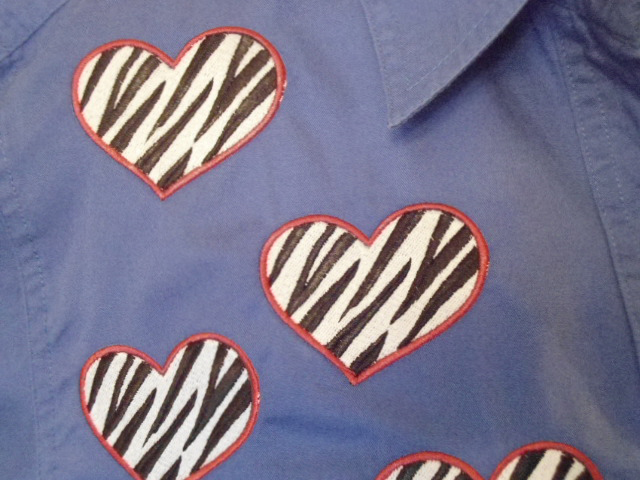 No iron-ons. 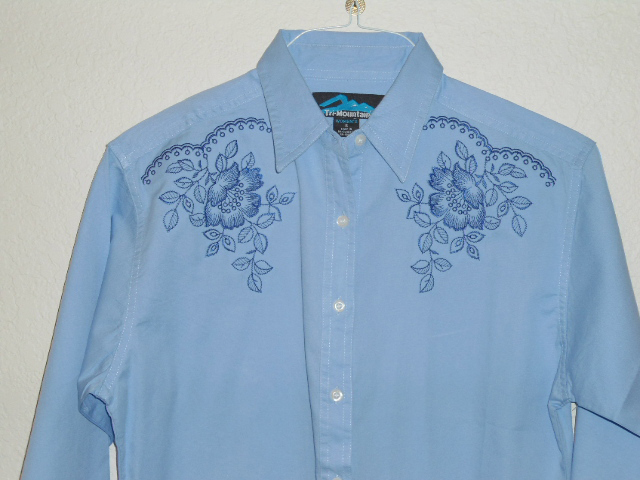 Most shirts are machine washable. 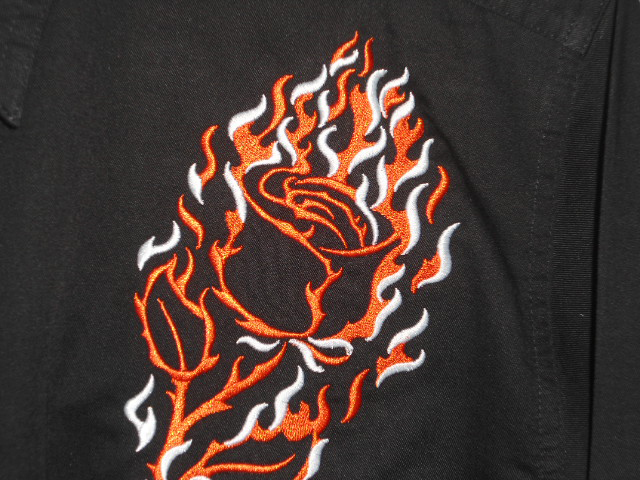 If you don't see what you are looking for, contact me with your ideas.  I will gladly try to create whatever your imagination can conjure up. 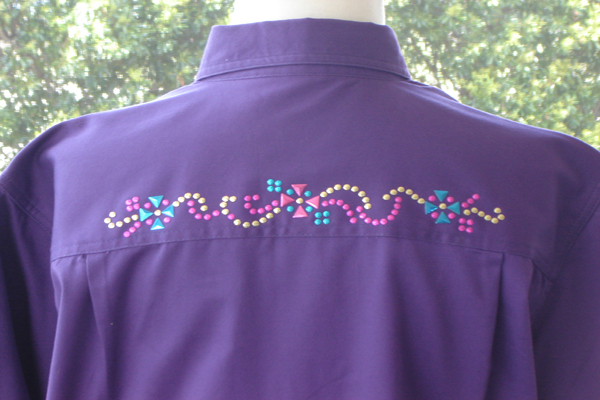 Grape rodeo shirt with yellow ultrasuede fringe over shoulders. 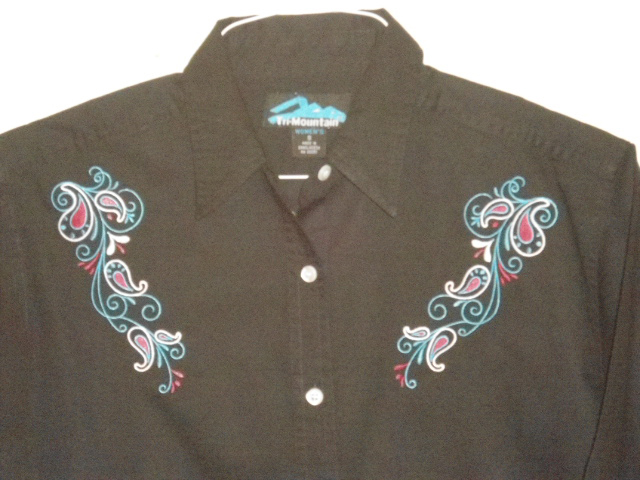 Neon horseshoes embroidered on front and neon barrel racer on back. 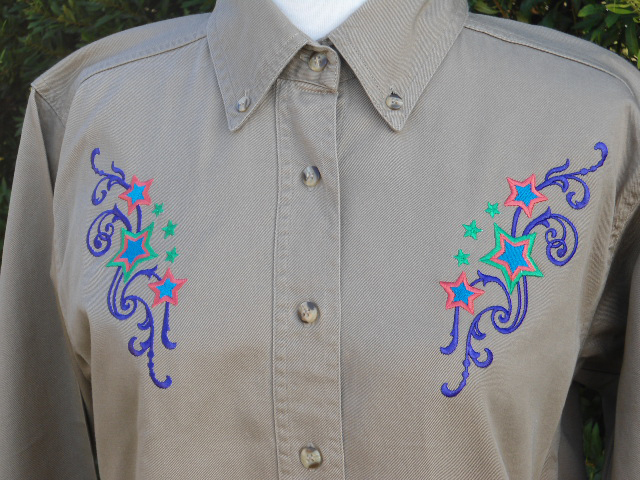 Tan rodeo shirt with embroidered southwestern designs in turquoise and rust. Rust and brown ultrasuede on shoulders. 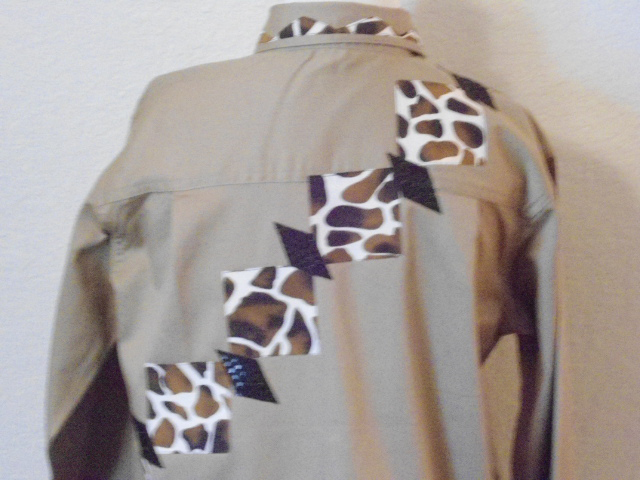 Bone beads added to brown ultrasuede. 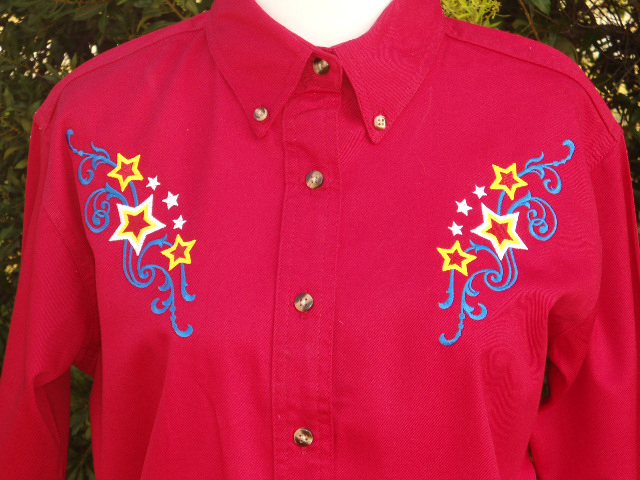 Yellow rodeo shirt with red barrel racer embroidered on front. 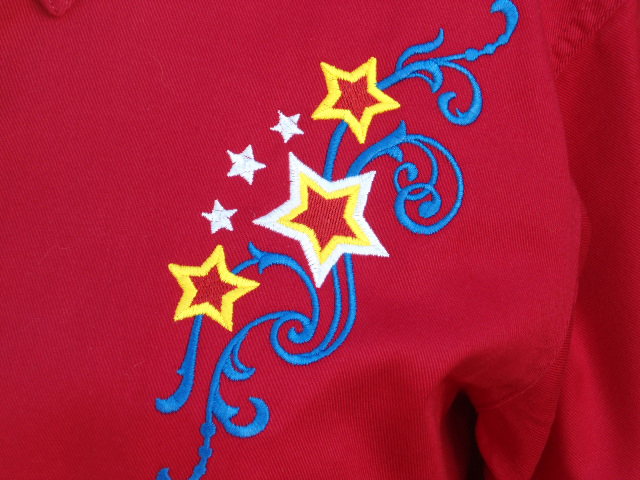 Red rodeo shirt with starts and swirls in red, white, blue, and gold. 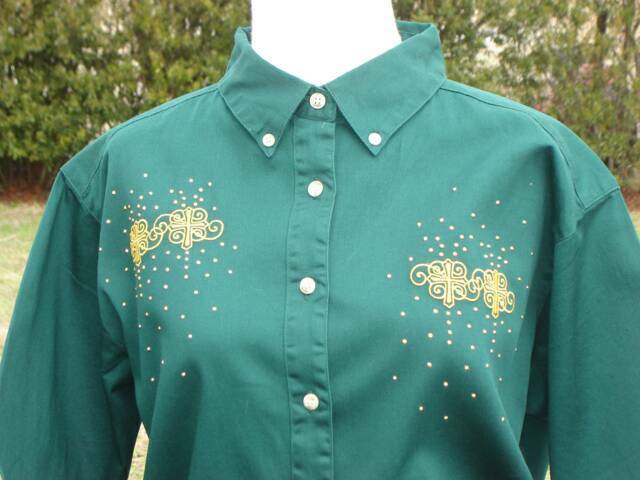 Green twill shirt, embroidered with a barrel racer. 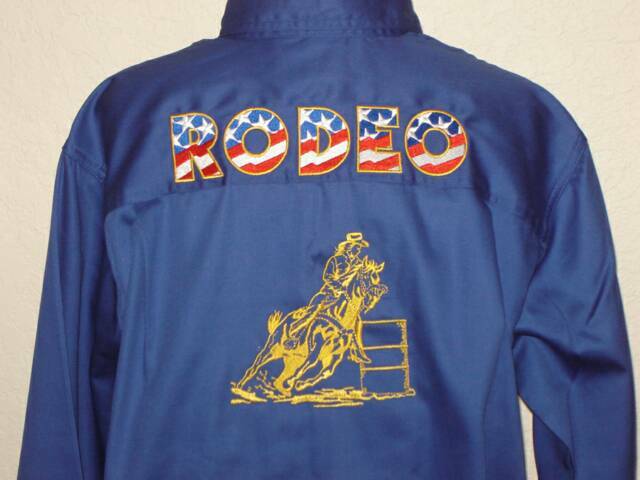 Barrel, shirt, and hat are in gold. 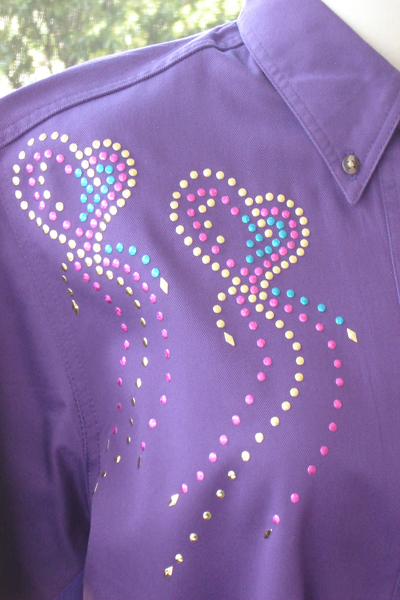 Purple rodeo shirt with gold, hot pink, and turquoise nailheads in shooting hearts on front, and a design across back. 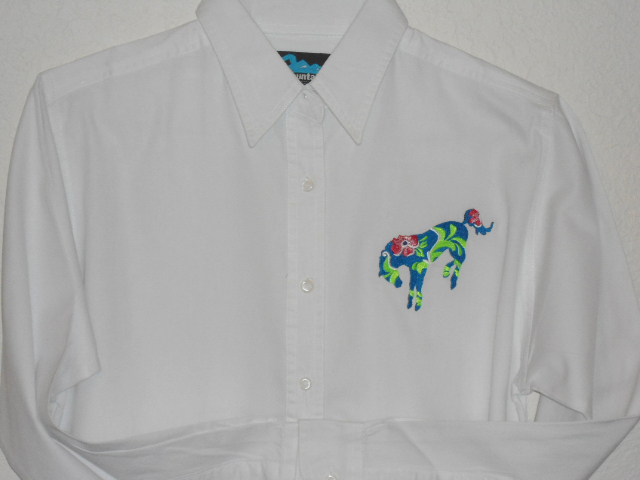 Shirt is darker than picture shows. 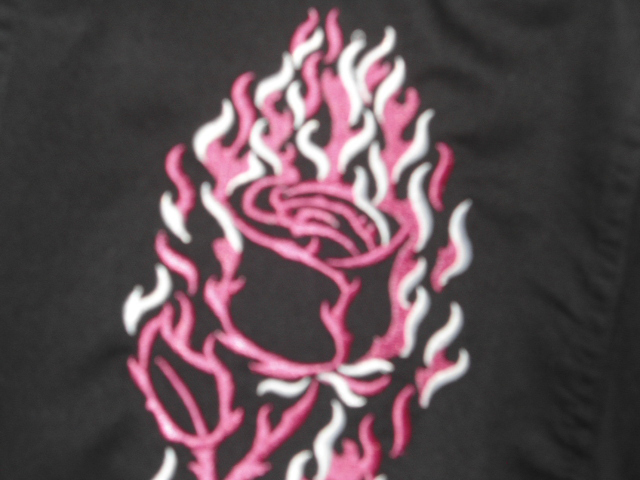 Pic makes it look washed out, it is a vivid purple. 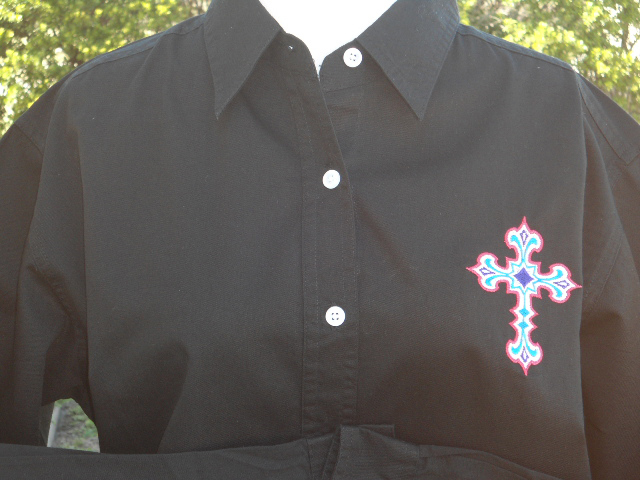 Green rodeo shirt embroidered with crosses and scrolling on both front and back. 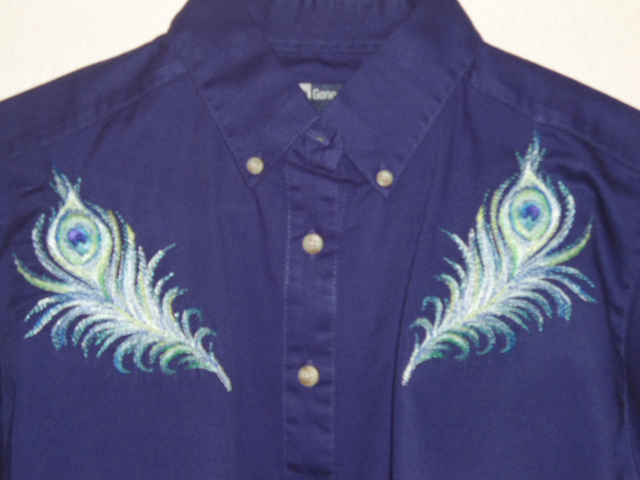 Embellished with gold rhinestuds. 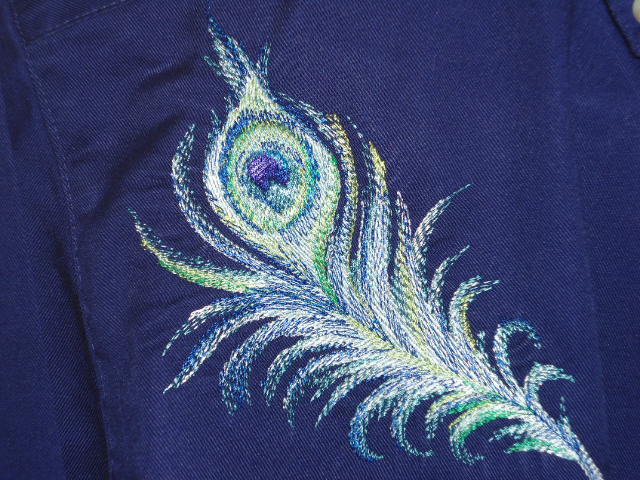 More glitter and sparkle than the photo shows. 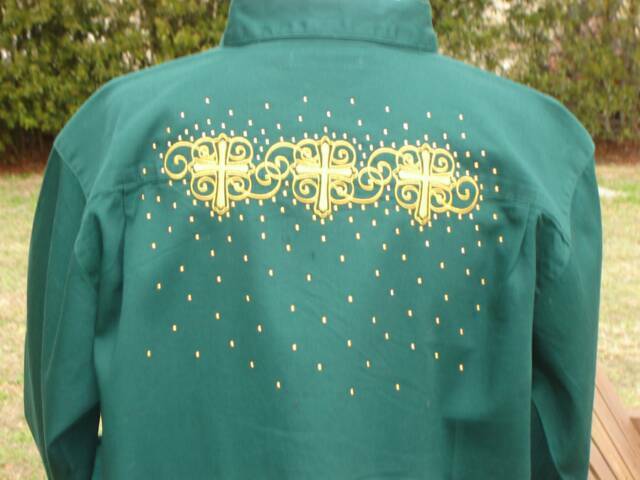 Shirt is a crisp green. 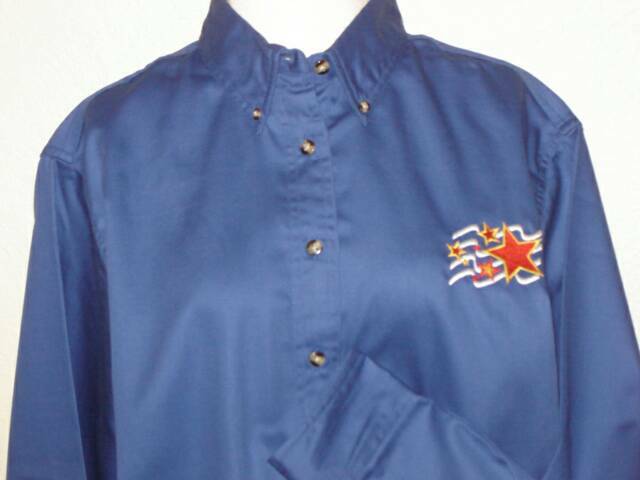 Red and gold stars, along with white waves on front. 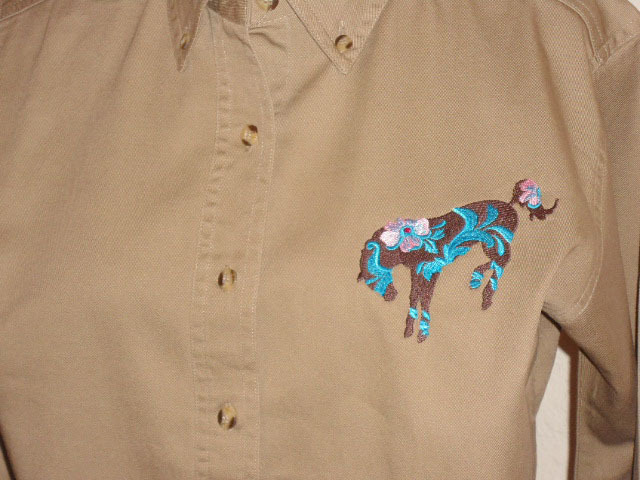 Khaki rodeo shirt with a brown bronc with turqoise and pink tooling. 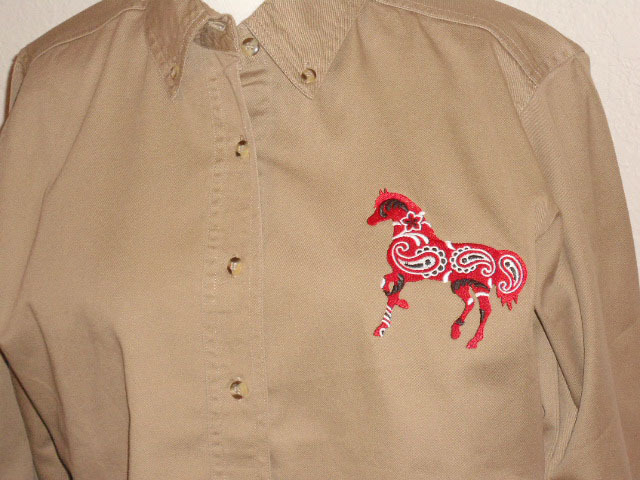 Khaki rodeo shirt with a red bandana prancing horse. 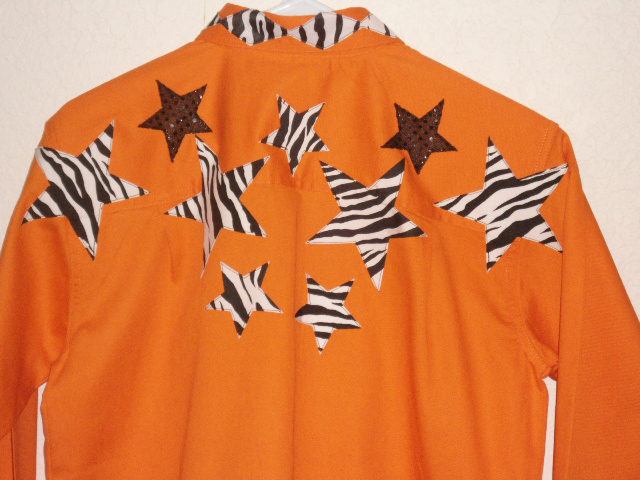 Orange rodeo shirt with black and white zebra stars, accented with black sequin stars. 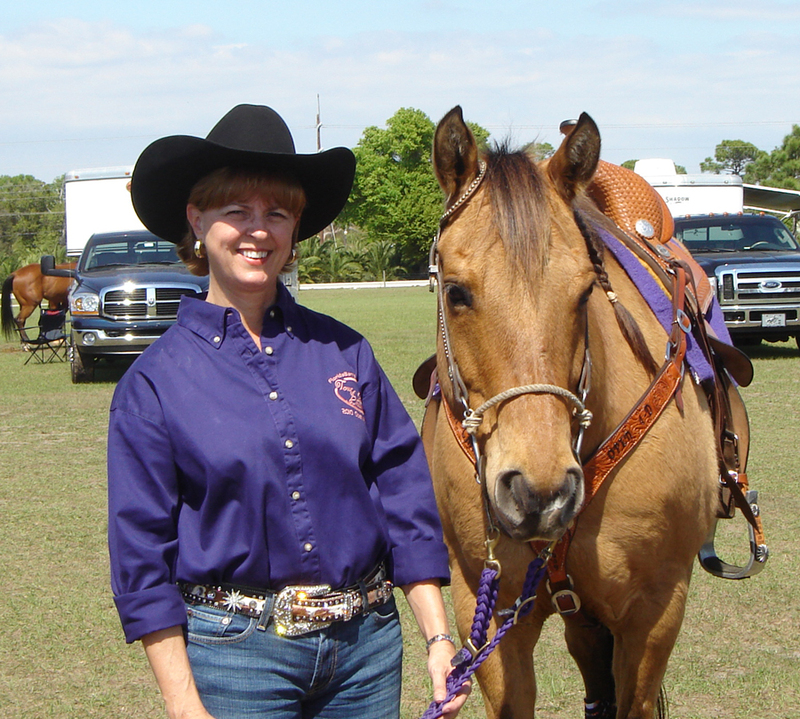 Orange really pops out in the arena, inside or outside. 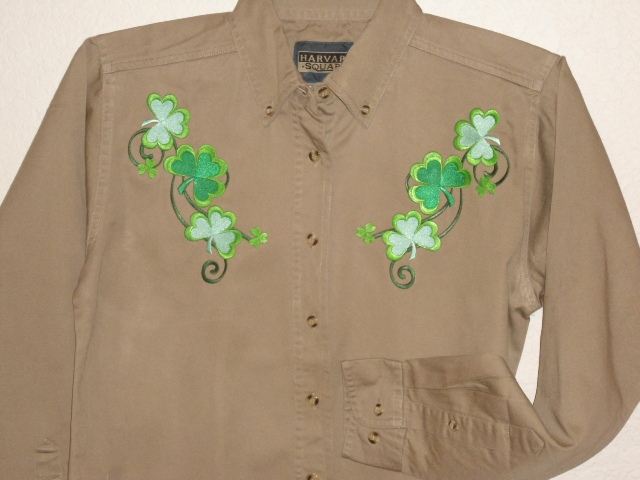 Khaki rodeo shirt with shamrock laurels on both side. 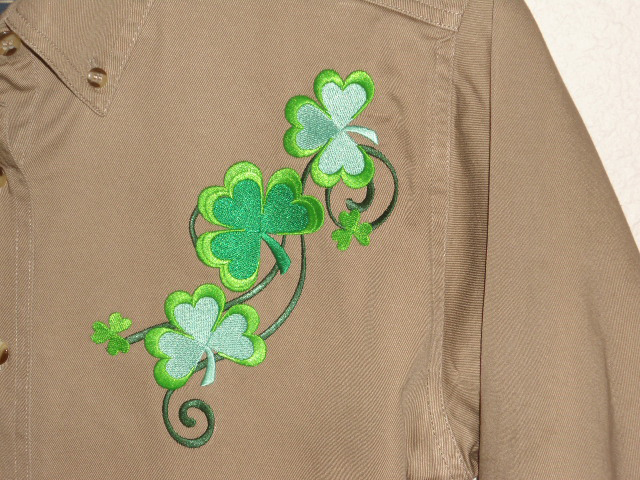 Carry your luck with you. 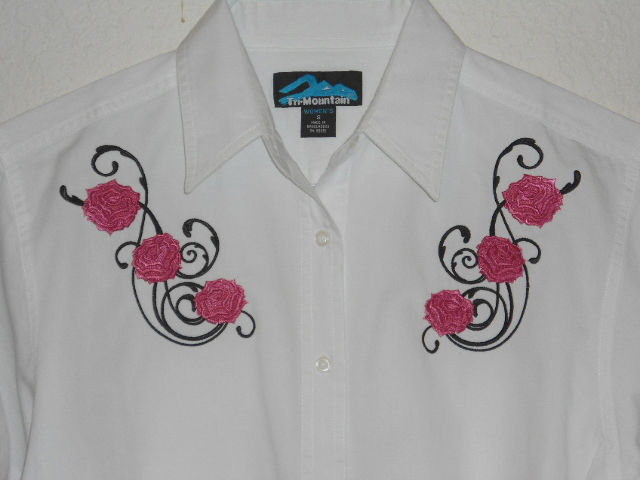 FREE SHIPPING TO THE LOWER 48 FOR ANY SHIRT ORDERED FROM THIS PAGE!!!!!!! 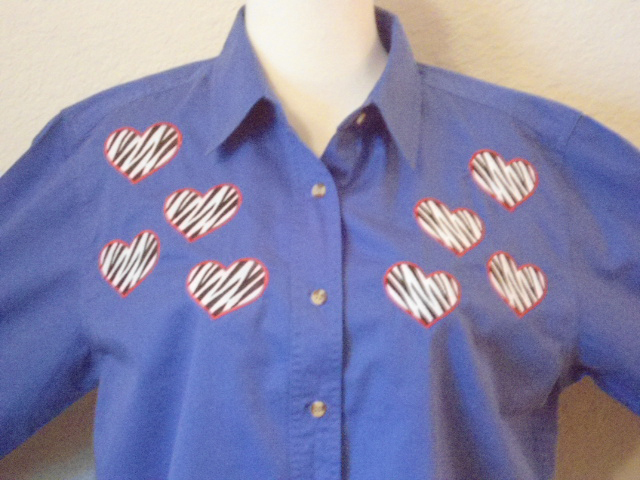 Sky blue rodeo shirt with zebra hearts on front. 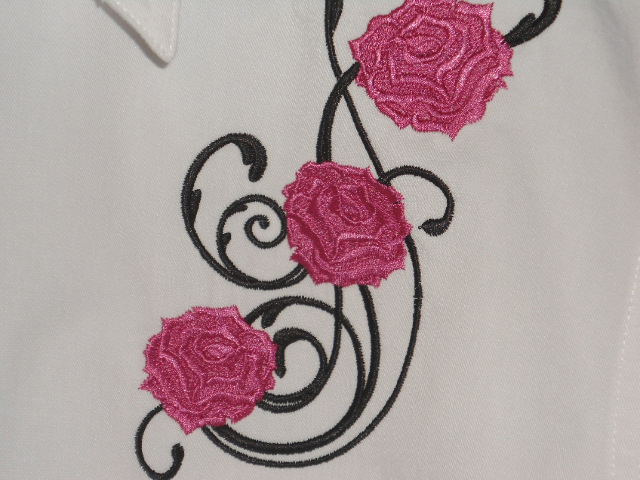 Hearts bordered in dark pink. 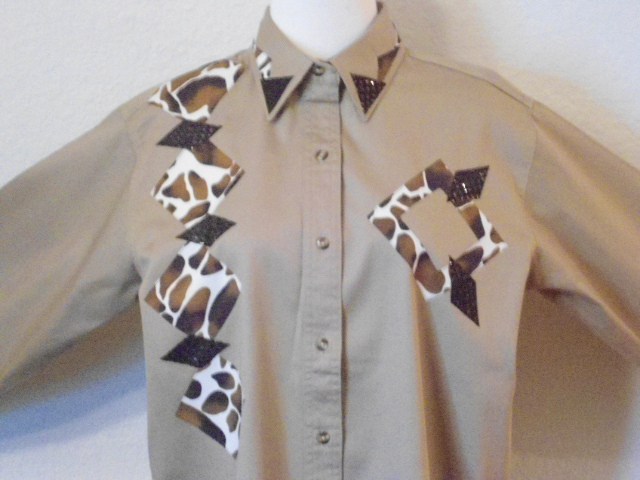 Khaki rodeo shirt, trimmed in giraffe and black sequin fabric. 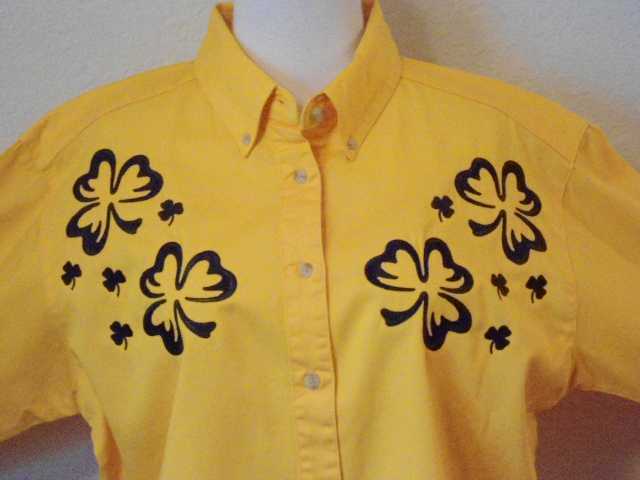 Dark yellow rodeo shirt, embroidered with black shamrocks in two sizes. 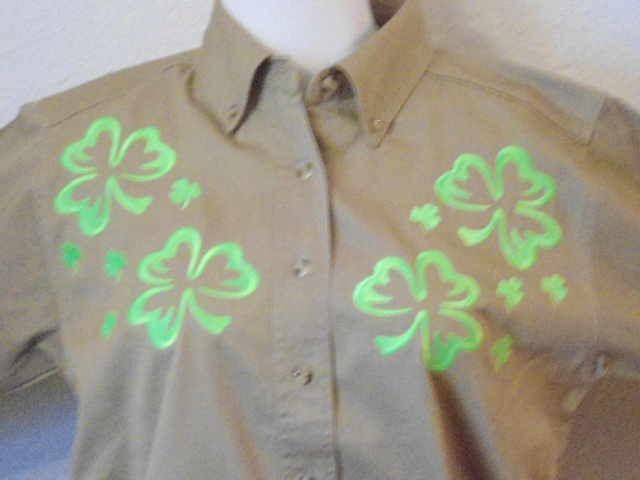 Khaki rodeo shirt, embroidered with neon lime green shamrocks in two sizes. 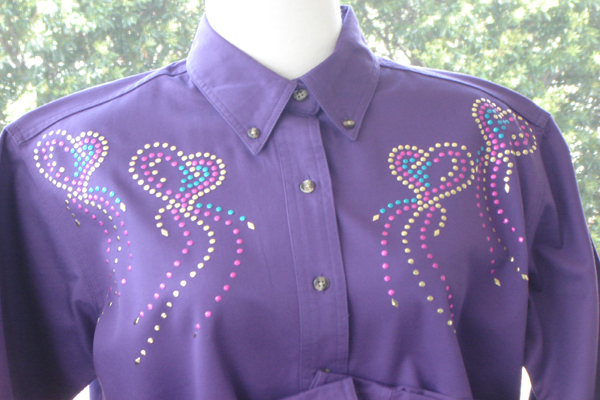 Purple rodeo shirt with embroidered with Canadian flag and two horseshoes. 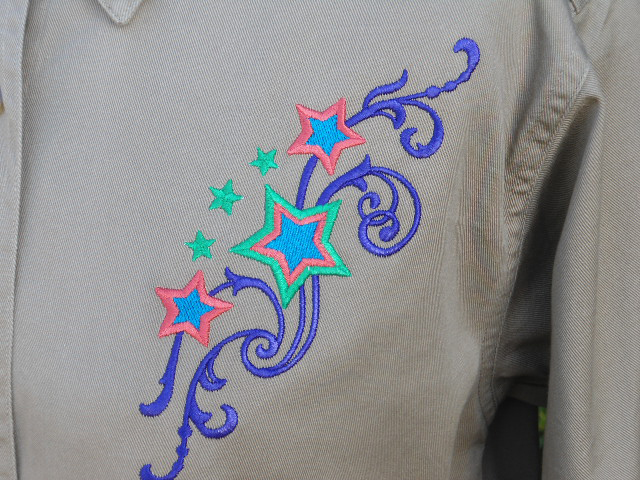 Khaki rodeo shirt, embroidered with stars and swirls in purple, dark peach, lime. 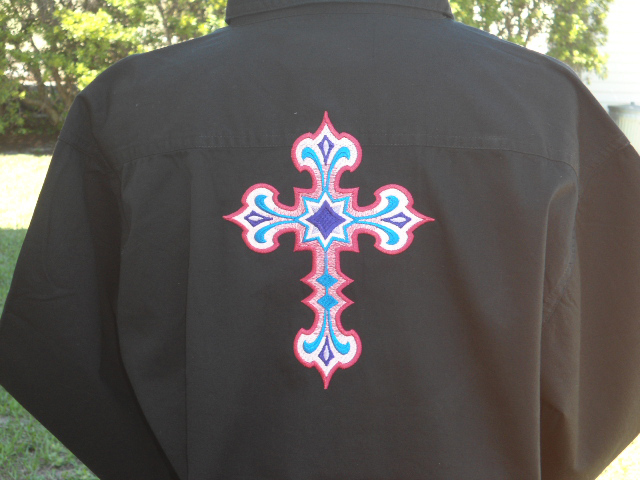 Black rodeo shirt with crosses on front and back in pinks, blues, and purples. 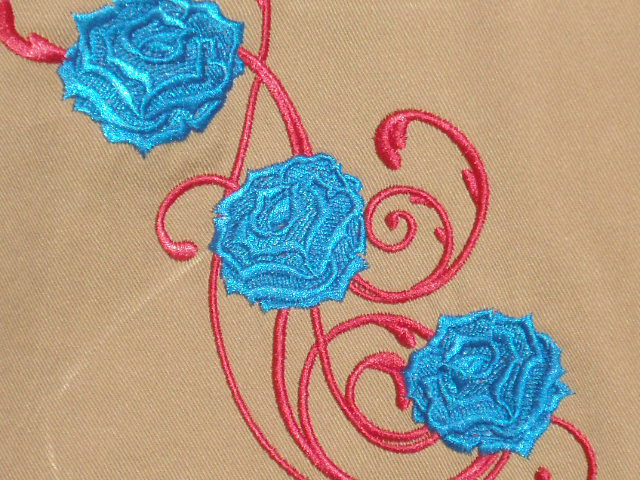 Very bright colors. Camera just makes it look faded out. 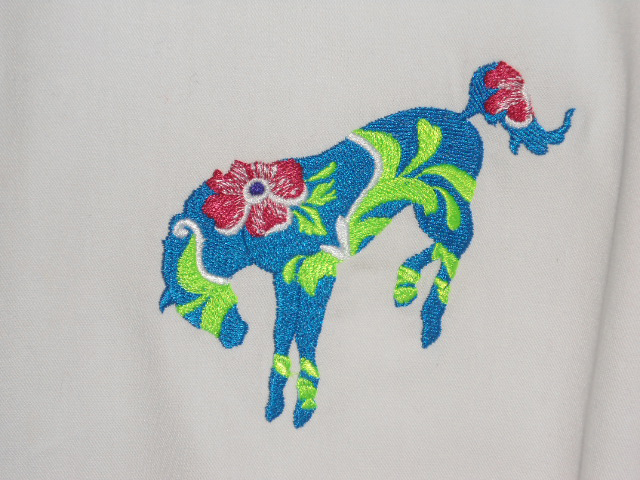 White rodeo shirt, embroidered with a bronc in turquoise, lime and dark pink. 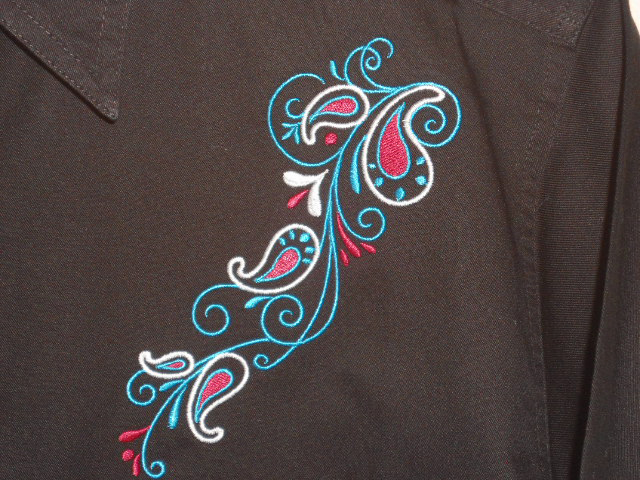 Black rodeo shirt, embroidered with a paisley in turquoise, pink and white. 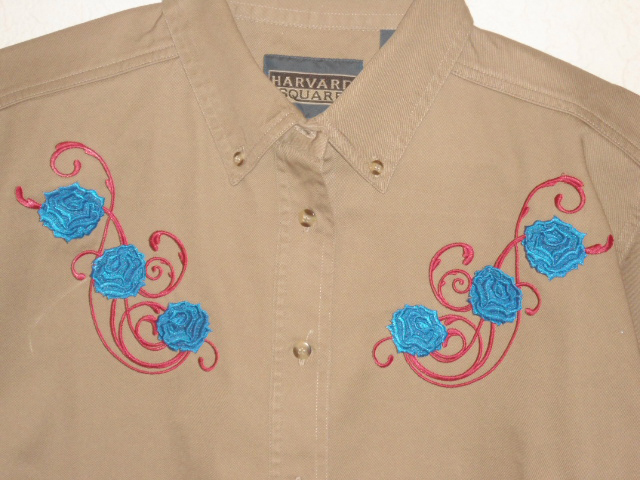 Khaki rodeo shirt, embroidered with roses in pink, swirls in black. 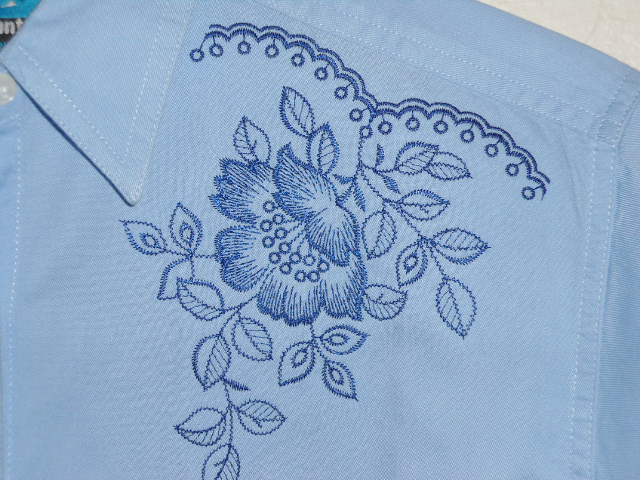 Light blue rodeo shirt, embroidered with a floral laurel in dark blue. 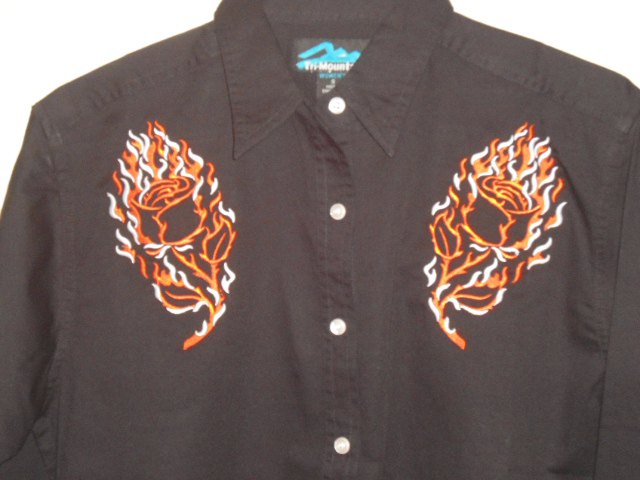 Black rodeo shirt, embroidered with flaming roses in white and orange. 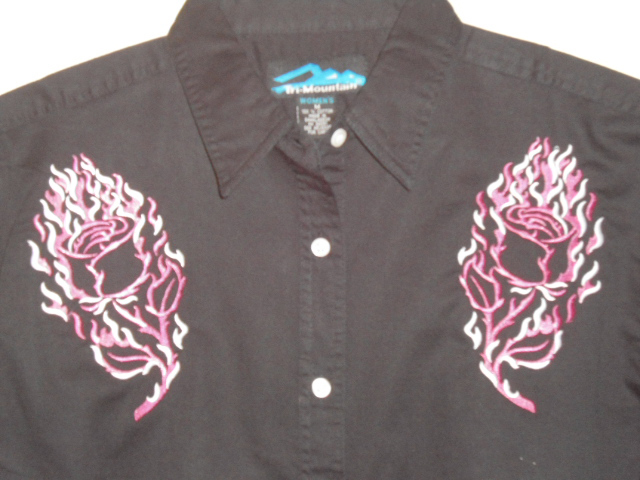 Black rodeo shirt, embroidered with flaming roses in white and pink.